Today, Google announced its new Stadia game streaming platform that lets gamers play games on pretty much anything with an internet connection. Laptops, desktops, phones, and even TV’s with a Chromecast Ultra attached are all supported. That means there’s no need to go out and buy a new console to get access to Stadia, but surely, Stadia must have some sort of proprietary hardware right? Yup, it’s the Stadia Controller. Looking like a mix between an Xbox One controller and a Nintendo Switch Pro controller, the Stadia Controller offers a traditional gamepad experience for all your platformers, shooters, and whatever else you might want to play. Like most modern controllers, the Stadia Controller has a very familiar layout featuring a D-pad, two analog sticks, four face buttons, and some triggers and shoulder bumpers in back. 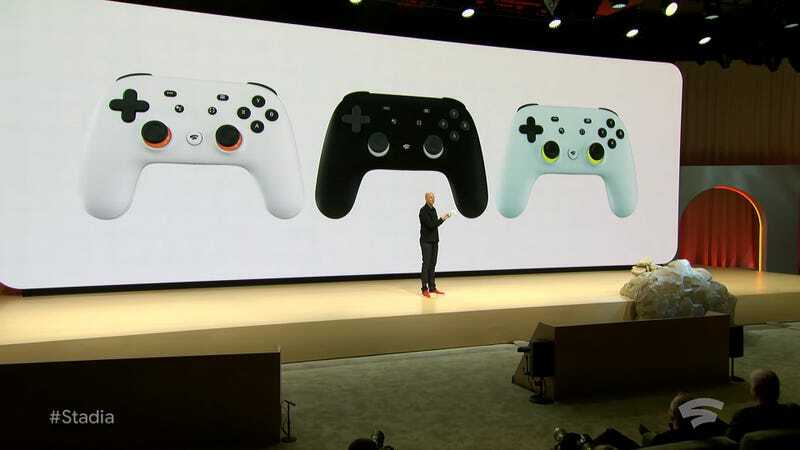 However, what separates the Stadia Controller from other gamepads is its dedicated button for the Google Assistant, and built-in wifi, which Google claims will help reduce latency so that your movements don’t suffer from lag while being transmitted to Stadia’s Cloud Servers. The Stadia Controller also has an included 3.5mm jack, presumably for audio, and a dedicated share button that will automatically record clips at the highest possible resolution (potentially up to 4K or 8K), before letting you share those moments on YouTube. Sadly, Stadia and its controller don’t have a firm price or release date yet, so we’ll probably have to wait until at least E3 to find out when all this will become available for real.